Warm Up - Passing & moving in 3s various combinations & technique. 3v2 in 1 half can the 3 blues keep possesion & transfere ball to other grid if succesful one blue can go into opposite grid to make 3v2 again if two reds win it how many passes can they complete before blues win it back. (rotated the players). Fimished with a game with two small goals 1 touch finish. 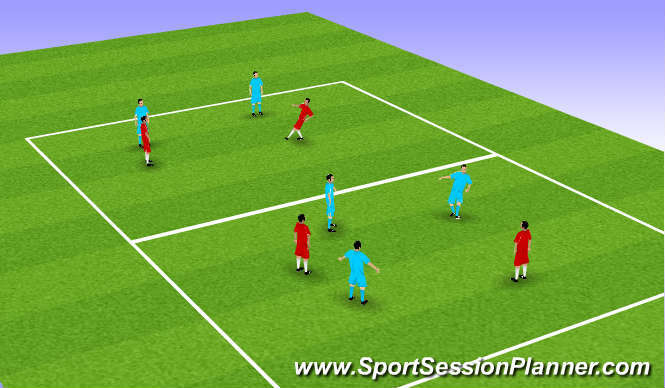 Passing,reciving, turning, weight & timing of pass. when & where to support angle, distance etc. timing of support. Anarobic, quick shot, passing, agility and balance. Players took a little while to understand the practice but as the session progressed there was a big improvement in the passing, support and decision making.